A student sports an outfit made out of garbage bags. Watch a slideshow of the Green Open House. How do you build a sustainable home that’s also affordable? How do you green your business? What are some simple steps to reducing your carbon footprint in your everyday life? Many experts were on hand to answer these questions, and others, at UC San Diego’s Green Open House Saturday. 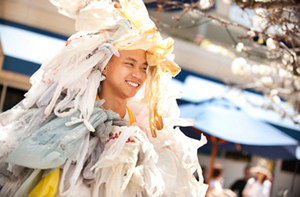 The event drew about 3,500 people from all over San Diego County and kicked off the campus’ Earth Week celebrations. In addition to faculty demonstrations, the open house gave visitors tips for greening all aspects of their lives, from a car show, to cooking demonstrations, to a landscaping show. 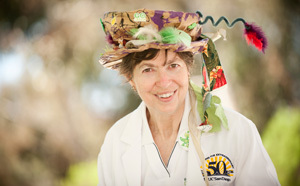 Chancellor Marye Anne Fox wears a hat created at the Rad Batter booth at Green Open House. Green practices now have to be part of the university’s mission, the chancellor said. The campus itself is a living laboratory for sustainability, she added. The open house featured campus initiatives in recycling, transportation, landscaping and food, Fox said. “It will give you a peak into that window in the future,” she added. Visitors could get a better glimpse of the campus as a living laboratory at a Green Business Summit that took place Saturday at the Price Center East Ballroom. The university is the second-largest energy user in the City of San Diego, said David Weil, UCSD’s director of Building Commissioning and Sustainability. Yet, every year, even though the campus is growing, it’s using less energy per square foot, he said. Campus officials have invested $60 million in retrofits, which resulted in a 20 percent decrease in energy use and savings of $12 million a year. The university also is using reclaimed water; has installed solar panel groves on parking lots and roofs; and is powering shuttles buses with biodiesel. Finally, all new buildings constructed on campus must meet at least a silver LEED certification standard—a stringent requirement. 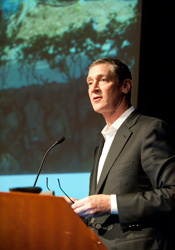 Architect James Timberlake speaks about green design. The new dorms rising at Revelle College are on track to reach the highest LEED level, Platinum, a feat never achieved on campus before. The building is the brainchild of architect James Timberlake, whose firm, Kieran Timberlake, is known for leading-edge green design. The firm has recently been awarded a contract to design the new U.S. embassy in London. Timberlake also has designed some of the sustainable homes actor and activist Brad Pitt is helping build in the Lower Ninth Ward of New Orleans. He applied here at UCSD some of the same principles he used in New Orleans and will use in London. The dorms will feature a green roof and photovoltaic arrays. The building also will be equipped to collect and treat water from showers and other sources that can then be reused for irrigation and other purposes. That will result in a 30 percent decrease in water consumption throughout the structure. The new dorms also will use natural ventilation. One of the main construction materials, concrete, will help retain heat in cool weather and dissipate it when it’s warm. In addition, the structure will be made of local, durable and sustainable materials that can be recycled. 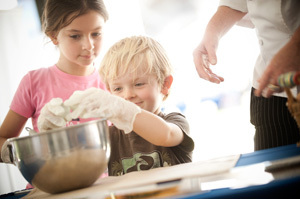 A little boy cracks an egg during a cook demonstration. Buildings are one of the main sources of energy waste in the United States, adding up to as much as 39 to 50 percent of the country’s energy consumption, Timberlake said. That means architects need to be at the forefront of the fight against climate change, he said. Over 50 years, the average house in San Diego consumes as much energy as a car would use to drive from here to New York 817 times, he added. “We’re all in denial about how much energy our buildings use,” he said. He urged everyone in the audience to keep that in mind when they set out to buy a new home or renovate their house. His company has designed LEED Platinum homes that consume $662 worth of energy a year and cost a mere $200,000 to build, he added. UCSD officials have been applying principles similar to those Timberlake outlined throughout the campus, and showcased the results Saturday. Paul Terzino, director of University Centers, explained that his facilities have saved 40,000 gallons a year since installing synthetic grass. Warren Mall was home to the Children's Zone, green car show and alumni beer garden. Workers are installing solar-powered faucets throughout the Price Center. They also are installing so called cradle-to-cradle carpet made of sustainable materials that can in turn be recycled. At a nearby booth, sophomore Ben Gould and junior David Freitas showcased some of the projects designed by their student organization, Engineers for a Sustainable World. The group received an $11,000 grant to develop a portable solar charging unit for laptops, cell phones and other devices. “UCSD is pretty much the best place to do sustainability research,” Gould said. The Green Open House also showcased groundbreaking research in biofuels, climate forecasting and other fields. A clean car show featured some of the newest designs in electric, hybrid, biodiesel and Compressed Natural Gas (CNG) vehicles including: Chevy Volt and CNG van; full-speed electric vehicles from Mitsubishi, Coda Automotive, Phoenix Motor Cars, Tesla and Nissan; an electric ATV; electric dune buggy; and a Formula Hybrid. The UCSD Fleet— ranked 22nd in the nation in Sustainability for “The 100 Best Fleets” organization’s ranking of government fleets—had some of its hybrid and alternative fueled vehicles on display as well. 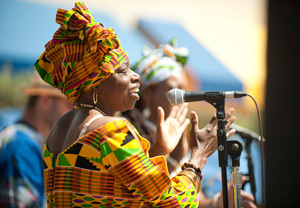 The African dance and drumming group Bolga Zohdoomah performs. Visitors also could drop off batteries, computer monitors, cell phones and other electronics during an E-Waste drive, which will run until April 20. All the electronics will be recycled. Younger visitors weren’t forgotten. They worked their wiggles out in a jump house and giant slide and on a climbing wall. They danced to the tunes of popular band Hullabaloo. They also learned about marine life from Birch Aquarium volunteers. 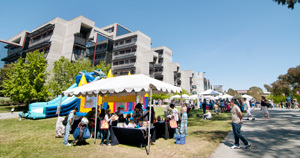 At the end of the day, visitors went home with plenty of goodies and a renewed appreciation for UCSD’s work, they said. Steve Chapkis, an alumnus, was checking out the green car show with his son. He is a product development and marketing consultant. Sustainability is one of the most fulfilling areas to work in, he said. “I’m really excited to see that UCSD is carving out a place of international importance in the field,” he said.